A native of Iowa, Mr. Tim studied Speech and Theatre at Iowa Wesleyan College and Iowa State University. He has acted in and directed numerous plays and musicals for the past 40 years. One of his best memories is playing Linus in "You're a Good Man, Charlie Brown" opposite Lucy, played by Mrs. Linda! That was the start of the Lindeen's lifelong love of musical theatre...together! Tim's favorite role is Dad to three grown, married children and Grandad to 12 grandchildren! Mr. Tim has been an active Realtor in the NW Twin City Metro area for the past 30 years. He also enjoyed the role of Worship Leader on the worship team and acting in productions at his local church for many years. 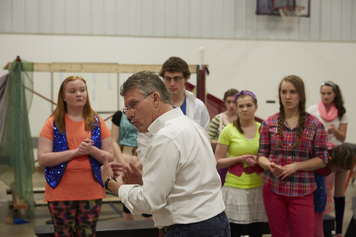 Mr. Tim teaches with the highest standards of excellence while always striving to create a joyful experience for each student as they develop their acting and drama skills. He is known for taking each of his students at their current level of skills and stretching them as he teaches and directs them. He is passionate about continuing to teach the love of acting and appreciation of good drama to today’s generation and also mentoring directors on his staff to follow in his footsteps for the next generation of student actors! Tim is also the Set Designer for all FPMT shows and loves to design and paint himself, and mentors student and adult volunteers to create amazing, beautiful sets. A farmer's daughter who grew up in Iowa, Mrs. Linda graduated with a BME degree in Music Education from Iowa Wesleyan College with emphasis in Voice and classroom teaching. She has taught vocal classroom music, directed choirs and musicals for over 40 years in grades K-12 in public schools, private Christian schools, local churches, in the homeschool community and now with her students at FPMT. Mrs. Linda is a former piano teacher and is a vocal coach. As Artistic Director of FPMT, she keeps everything running smoothly, including mentoring the teachers on the FPMT staff, working with the many student and parent volunteers, office work, teaching when needed and helping to costume all shows. Linda and her husband, Tim have three grown married children and 12 grandchildren who fill their lives with joy! It is an amazing blessing to have many of them now in classes and on stage with FPMT! Mrs. Linda loves to teach students of all ages the joy of music and theatre, while always maintaining a high standard of excellence. Her lifelong dream of owning and running a Christian based, family theatre for students has been realized and is the joy of her life!